Paint SCENTsations! clean & crisp, 1oz packet. Sometimes just plain paint isn’t enough. Paint additives can do many things, from reducing the drag on a brush to providing anti-slip characteristics. There are many different paint additives from a wide variety of manufactures. Most do the same things to the paint; reduce the drag of the paint, make the paint flow on a surface, add texture, allow paint to stick to difficult surfaces, make paint smell better and reinforce the antimicrobial properties. I will reference some of the more common brands while explaining the different types of additive available for typical house paints. Paint conditioners add flowing or leveling properties without excessive thinning. These paint additives are available for both oil based and water based paints. Modern acrylic paints have rapid dying and this doesn’t allow the paint to flow on a surface, making brush marks more prevalent. One good product designed for acrylic paints is Floetrol by Flood Co. This type of product slows down the drying just enough and adds a silky feel that is evident when brushing or rolling. This translates into less work and fatigue. The same properties are available for oil based primers and paints. Penetrol, by the Flood Co., is one such product. It is deep penetrating oil that is added to oil based products to increase its “wet edge” time and gives a smoother feel when brushing. Both of these paint additives won’t evaporate as fast as the usual solvent, water for acrylic/latex or mineral spirits for oil base paints. They actually fortify the paint instead of cutting it down, maintaining the original qualities. Another good brand I have used is X-I-M Paint Extender, Latex X-Tender for water based paints and Oil Based X-Tender for oil based products. One of the most difficult situations for any paint to deal with is a chalky surface. In most cases a binding primer should be used. But if the cost of priming is too high, it is possible to give acrylic paints more penetration and bite. One good product is Emulsa-Bond. It is emulsified oil that is added to acrylic/latex paint in order to increase its bond to questionable or chalky surfaces. The only down side is Emulsa-Bond is a little difficult to clean up, get out of brushes or rollers. The range of products that give paint a textured look or feel ranges from fine aggregate, sand paint, to rolled on texture paint for hiding minor imperfections. Also in this category is a granular powder can be added to paints to make painted floors less slippery when wet. Texture paints are paint and texture in one application. A good example is Wel-Cote, which is available in different thicknesses and can be applied using their specialty rollers or worked with different combs and pattern brushes specifically manufactured for this texture paint. 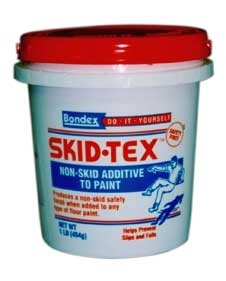 This product works well, but you will need to experiment before applying it to an entire room. Other texture additives are available that are mixed into your paint. Most produce a sand finish. This is similar to sand additives for floor paints that produce an anti-slip surface. 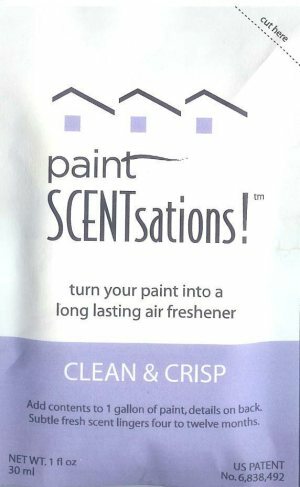 This idea is turning your new paint into a long lasting air freshener. In this case “long lasting” means 6-12 months. The idea isn’t new. In the past, distant past, the idea was to reduce the smell of curing paint. Now with low VOC paints the idea can be taken to a new level. These products, a good example is Paint SCENTsations, are mixed into the paint before application and provide a subtle fragrance. For many home owners this would be a novelty item. But it could be very useful for building maintenance, especially with apartments or house rentals that need a little more than a new color. This is the most interesting category of paint additives. If you live in a moist humid area and you are tired of constantly washing or cleaning off mold or algae then this might be a good category for you. One product I have used in the past is M-1 Paint Additive by Jomaps. M-1 is approved by the E.P.A. and effectively kills and controls mildew. The active ingredient in M-1 Additive was proven by the National Bureau of Standards to give perfect control of mildew for 3 years. Imagine painting and not having to worry about mold and algae damage for three years. This paint additive, and others like it, could save more than a little labor cleaning.